We said goodbye to my family in snowy Maine and boarded a southbound plane. Petra and I took her first plane trip when she was two months old , and now at five months she was already a traveling pro — having logged more in the air and on the road miles than many kids ten times her age. I was way more relaxed having already seen how she reacted to air travel, and now having my husband with me, I knew this trip was going to be okay. I knew I would do the majority of the caretaking on this flight to the Dominican Republic, since Petra’s favorite thing to do when traveling is nurse herself to sleep. But still, it was a big relief to know that I would be sitting next to someone I knew and loved. I followed the advice that breastfeeding, especially during takeoff and landing, can help alleviate air pressure changes on a baby’s ears, but it can be a little awkward breastfeeding so close to a male stranger (as on our first flight to Arizona). More importantly, my seat partner this time could help entertain the baby, and I didn’t have to worry as much about annoying the nearest passenger to me if she started kvetching. 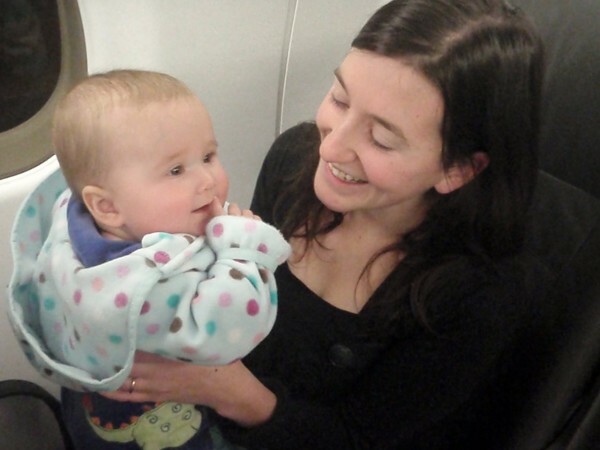 Flying with my husband also meant that there would be another person to hold Petra so I could even go to the bathroom — an act that quickly becomes a luxury for a new mother. Not to mention the fact that someone else would be there to share the excitement and adventure of traveling with a baby. 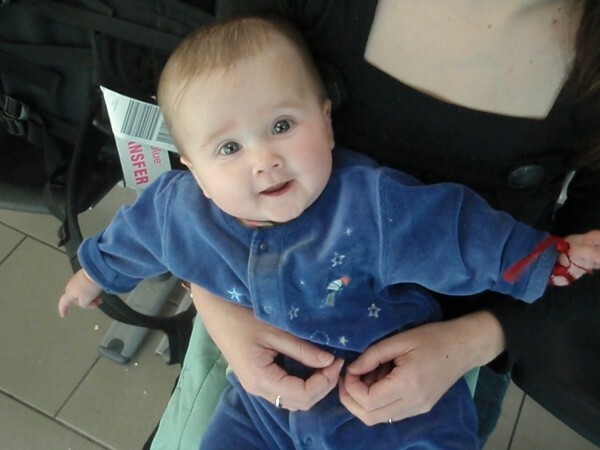 Petra travels as a lap infant on planes. 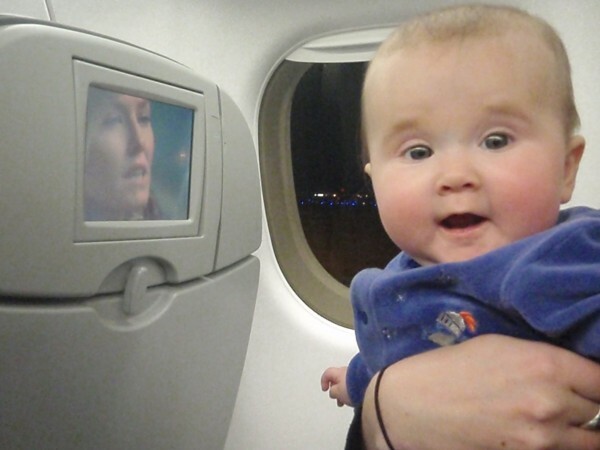 You are not required to buy an extra seat for your baby on the plane until he or she is two years old. If you want to buy a seat and strap them into a car seat you can, but we travel on a tight budget and this didn’t seem at all worth it to us. Although Petra’s safety is a top priority, the benefits of a car seat in a plane crash seemed pretty minimal to us. We traveled on Jet Blue from Portland, ME to Santiago, DR with a short layover in JFK. I actually appreciate layovers now that we are traveling with a baby. Now I prefer to break up long air trips with a place where Petra can walk around (in mom’s arms or on her own) and have an easy place to feed her and change her diapers. The first flight to JFK went quickly and smoothly. We took advantage of the airline policies that allow people traveling with small children to board first.No sooner had we boarded then Petra nursed and fell asleep for almost the whole flight. We tried a pacifier, a little television, some shiny toys, and finally some singing calmed her down enough so she would eat and go to sleep. Petra woke back up half an hour later, but this time was happy happy happy. We then set foot on foreign soil for the first time as a family. Hello, just wanted to say how much I am enjoying your site. I have a one year old daughter, we travel quite a bit abroad so your tips are very useful! You have a lovely writing style. Well done. Thanks, Laura! I really appreciate hearing from other traveling families!